We can get libcryptocpp.so. Next is to use this library from Android side. Application.mk is appliction makefile common settings. Prepared 2 directories under jni. cryptocpp is crytocpp core library and headers. I put libcryptocpp.so under it. All shared libraries move under armeabi including STL. 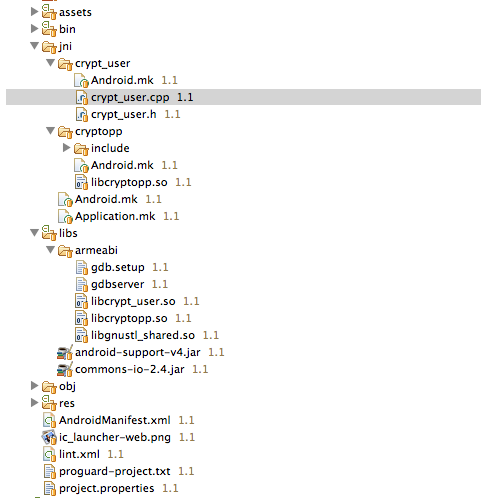 crypt_user has codes of this project, it is JNI codes. 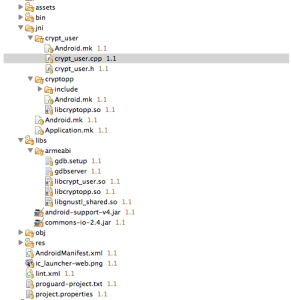 In JNI, we need define method in extern C in Android. std:string part doesn’t work. So I gave up std:string codes. char * is also fine I thought. You could definitely see your enthusiasm within the paintings you write. The arena hopes for even more passionate writers like you who are not afraid to say how they believe. At all times go after your heart.